The modern nurse is a highly trained professional who works in a wide variety of areas from community nursing to surgery. Nurses and nursing teams have a vital role in the care of patients in a health care setting. With this online Diploma in Nursing and Patient Care course, you can boost your nursing career and improve your ability to help millions of people who need medical assistance. As a nurse looking after the welfare of patients with medical needs, it is important that you learn the important skills and techniques involved in environmental health and safety awareness. This course will get you up to speed on these techniques quickly and clearly. You will also be guided through the role of a nurse in diet therapy, as well as how to ensure patient safety and comfort in the adult care setting. Providing proper nursing and patient centered care is a delicate task. 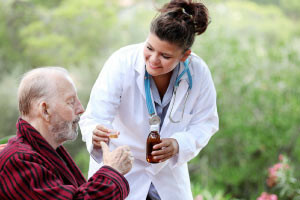 As you get further into the course, you will learn the functions, methods, and techniques applied to adult patient care, with particular emphasis on daily bath and oral hygiene. You will also learn the benefits of back massages and exercise routines for improved patient care. How to carry out the physical examination and assessment, specimen collection, and measurement of patient vital signs are also tackled in the course. By taking this free online course, applying patient centered care and nursing practices that help maintain the health and safety of both nursing professionals and patients in any health care setting will become much easier. The course will particularly benefit health care professionals who would like to learn more about the procedures and techniques used in modern nursing, as well as students who are planning a career in nursing or other areas of the health care sector. Describe the role of the nurse in patient care and patient hygiene. List health and safety measures for nurses. Describe movement and exercise routines that nurses can utilize for improved patient care. Summarize the role of the nurse in diet therapy. Describe the role of the nurse in the physical examination of the patient.